Yooralla supports people with disability to pursue their employment goals by providing job skills training and building pathways into employment. Improving access to jobs and equality in the workplace for people with disability is one of our highest priorities. Yooralla can work with you to develop a plan that supports you to build your job skills and your capacity to gain meaningful work and earn a wage. We can tailor a job skills program to suit your individual needs and capabilities, and can support you to transition into the employment that is right for you. Yooralla’s Employability Program – supports you to build your job skills and provides on-the-job employment training. We can tailor a job skills program to suit your individual needs and capabilities and support you to transition into the job that is right for you. Learn more about Yooralla’s Employability program . Supported employment opportunities – if you want to work now, opportunities are available within Yooralla’s Business Enterprises and through external partner organisations. We are committed to providing opportunities for you to earn a wage, and prosper from satisfying and rewarding employment. Learn more about supported employment. Transition support into open employment - Yooralla can support you to transition into a paid job of your choice with an employer in the community. We partner with businesses in our local communities, creating opportunities for you to develop new skills, build social networks and be a part of the wider community, whilst earning a wage. Learn more about open employment. Learn more about Open Employment. Are you finishing school soon and wondering what to do next? Yooralla has a variety of opportunities available for you. 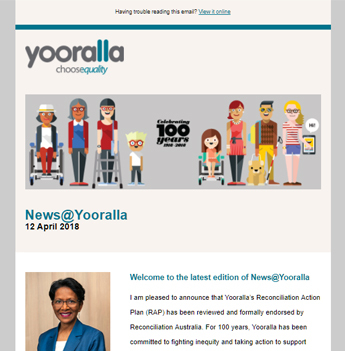 Whether you’re interested in a job, study, volunteering, learning new skills – or just having some fun – Yooralla can support you to plan what’s next for you. Talk to us about the programs or work options that interest you, and together we can create a pathway to achieving your goals. You can view and apply for current vacancies available through Yooralla online.